Musings 'n scribblings of a philanthrope .. : 16 Psyche, one of the largest and richest asteroids ..
16 Psyche, one of the largest and richest asteroids ..
What does this asteroid, 16 Psyche, 200 km diameter, 450 million miles away (3x distance between Earth and Sun) in the asteroid belt between the orbits of Mars and Jupiter, one of the top largest asteroids, moving at speed of 25 kms per second, have in making it so very important and attractive to the world ? Precious metals worth GBP 8000 quadrillion or $10,500 trillion .. It would crash the world economy which had a GDP of about $75 trillion in 2016 ..
Psyche is composed of metal made up almost entirely of iron, nickel and (presumably) a number of other rare metals like gold, platinum, copper, cobalt, iridium and rhenium. There’s nothing else like it in our galactic backyard. 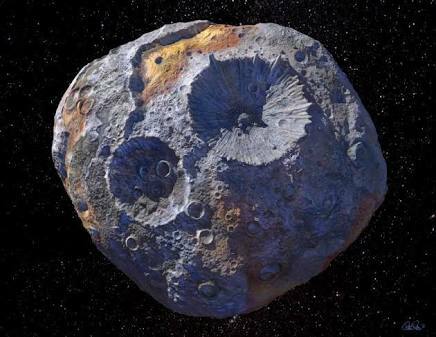 Can NASA in it's $450 million project Psyche, manage to bring even a portion of this asteroid to earth ?